Damodar Dahal, a senior majoring in mathematics, physics and computer science, and Professor of Physics Dr. Gerard Blanchard work on Project ROOMIE 1. 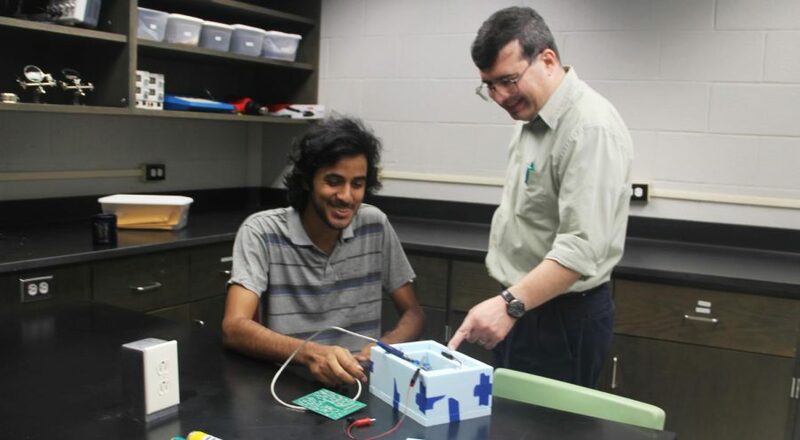 Professor of Physics Dr. Gerard Blanchard works with a team of four students to construct and design a fully functional weather balloon due to launch from Palestine, Texas in May of 2019. Project ROOMIE 1, or Remote Observations Of Many Interesting Events, was funded for the first time by the Louisiana Space Grant Consortium this August. Blanchard explained that the purpose of the project is two-pronged. In addition to learning how to construct the balloon, Blanchard also realizes that there is another facet to the education experience. Blanchard explained the scientific purpose. Blanchard explained how the students will calculate the connectively available potential energy. In order for the results to be as similar as possible, Blanchard intends to launch the weather balloon with the students from Palestine, Texas, about 110 miles from Dallas. Blanchard mentioned some unfavorable places that the weather balloon could land, such as in a tree or river. Damodar Dahal, a senior triple majoring in mathematics, computer science and physics, is one of the students working on Project ROOMIE 1. His task is to program the balloon satellite control board. Blanchard plans to submit a proposal for ROOMIE 2 and is hoping to have a couple more students join him for the next time around. Although Blanchard has not begun advertising for this opportunity yet, Dahal had some words of advice for students who may be interested next year.